The City Council frequently proclaims that Elk Grove is “open for business.” But some Council decisions appear to contradict this and does not always create a level playing field for small businesses and the development industry. The April 25th City Council Agenda item 9.1 is a request by Sterling Meadows, LLC for a time extension of their development agreement, which is due to expire in a couple months. City Staff has recommended denial of the extension, as city staff wants changes from the previously approved 2007 plan to now include 30 acres of designated commercial/office land along the southern border of the development on Kammerer Road. 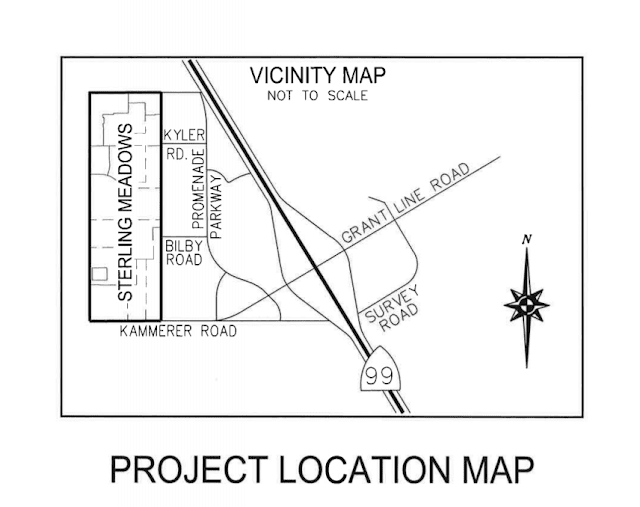 The Sterling Meadows plan has a long history with the City Council, beginning with the approval of the original plan in June 2007. However, the April 25th staff report ignores this history. In 2007, the City Council consented to remove commercial/office from the General Plan and the original Sterling Meadows plan was approved with no commercial/office component. Now the staff is recommending that the City Council reverse its previous decision and not extend the Development Agreement unless Sterling Meadows agrees to put the commercial/office back in. Do we now have a case of Council flip-flopping and testing the mantra of Elk Grove being open for business? Development Agreements are binding contracts between the City and Developer. In this case, Sterling Meadows purchased the land and has begun building tracts of homes in accordance with the terms of the 10-year agreement. Does pulling the rug out from the developer now after 10 years still mean the city is open for business? Is the city stuck between a rock and a hard place? Has the city sold a bill of goods to LAFCo and SACOG that it will create more jobs to justify expanding the city boundaries? Wednesday night ought to be interesting. Flip-flop or accept the market reality? The solution is easy. Take a page out of the SEPA (Southeast Policy Area) playbook and slap on a "Hybrid Zone", you know, anything is permitted. Everybody walks away happy and the November elections will work out okay! Sure indicator: Look to see which developers are sitting in the front row of Elk Grove City Council chambers making sure their presence is known to their "peeps" on the dais; usually sitting right in front of the council member they most want to carry their load with cell phone in hand just in case the council members veer off script. And the Elk Grove City Council thinks we haven't figured out the game! Although I am not as nearly familiar on this topic as Ms. Wheat seems to be, a thought has occurred to me. Given this project was approved about 12 years ago, I am guessing the current owners have not paid there "honorariums" to any of the current council members, save Mr. Hume who was the only serving at the time. It is pretty easy for the council to have staff recommend shifting 30-acres of lower-profit office commercial park zoning to this development since the council members are under no financial obligation to these owners. And, as Mr./Ms. Blutarsky points out; the SEPA has looser development standard, the owners in that area who have paid their "honorariums" to the council members, can shift some land meant for offices space to rooftop development which is far more profitable. As a bonus, in the short run, before the inevitable SEPA rezone, the city can say with a straight face they are zoning for more jobs. This reminds me of being hustled as a teenager at Tony Packo's by a grifter running a shell game.